Hot damn y'all. Welcome the Southern California chapter of the Urban Land Scouts (also known as designer Gabriel Hargrove...be sure to check out his gorgeous drawings here). Traveling by bicycle along one of the greenway streets affords greater safety when pulling over and photographing or observing. Victoria street is close, only one mile from home. Shopping at a nearby citrus mart along this street is an older German frau, her accent is strong, and I inquire about it. Now I can't remember where she said she was from. She owns a grove apparently close to the market, and thinking back I wonder for what she came to buy. Daily I encounter mostly Mexicans, so her accent struck me at once as strange but welcoming. If I spoke Spanish, it might suit me better since I find the produce typically is better in these smaller, Spanish-speaking groceries. The row of houses I live on is extremely ethnically diverse, there are a few Caucasian and Mexican families, as well as Indian, African American, Asian and mixed-race families. The smells of cooking in our crowded townhome walk is as varied as the languages overheard. 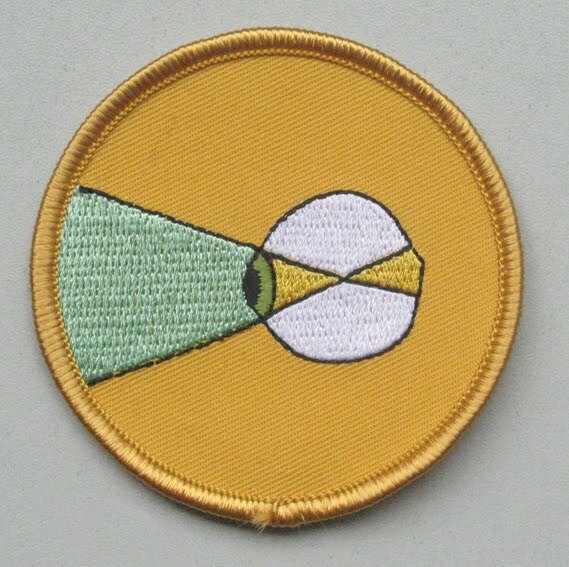 This comes from Molly, the first Urban Land Scout in Chicago, and earns her a shiny new(ish) Level 1 badge. I work on Navy Pier in Chicago every day. There are lots and lots of birds around the pier: Canadian Geese and seagulls of course, but I've also seen barn swallows, red-wing blackbirds, mallards, common sparrows, and a whole bunch of other "sea" birds I can't identify. A few weeks ago, it must have been dragonfly mating season and the air by the lakefront up and down the city would fill with hundreds, thousands of hovering dragonflies in the late afternoon. Watching from my office windows, I saw swallows nabbing these bugs half their size and having a protein packed meal. In the winter, people ice fish off the pier. I once grabbed a fish on the walkway that was gasping and flopping. I thought it had been forgotten by the catcher. So I threw it back into the water. Turns out the fisherman was sitting in his idling car right across from me, smoking a cigarette and staying warm and letting the fish die slowly of asphyxiation. He yelled at me. I ignored him and went to work and kept smelling my life giving fishy hands on my way to the washroom. Sometimes I get there before sunrise. All the geese are in flocks on the water, floating and drowsing and bobbing up and down until the sun comes out strong and wakes them up. 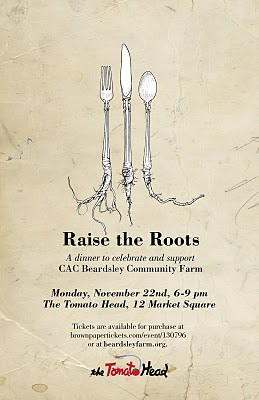 I am excited to announce "Raise the Roots: A dinner to celebrate and support CAC Beardsley Community Farm." 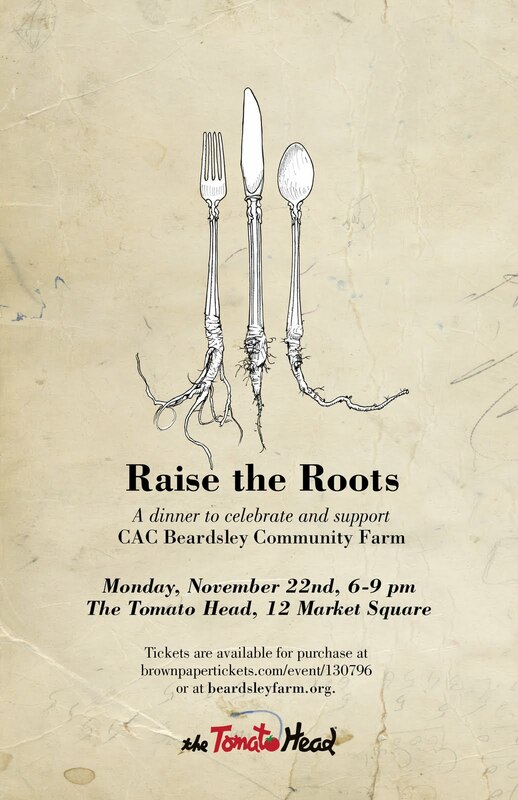 This fundraising dinner will be hosted by the Tomato Head on Market Square, Monday evening, November 22nd, from 6-9 pm. Tickets are $25 and available for purchase here or by clicking the button below. Dinner will be prepared by Tomato Head owner, Mahasti Vafaie, and Maryville Tomato Head cook, Robert Birkholtz. Doors open at 6 pm and the buffet dinner will be served at 7:30. 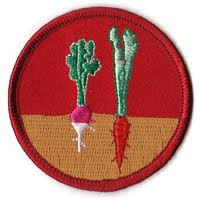 Please help us spread the word about this event and about the important work of Beardsley Community Farm.